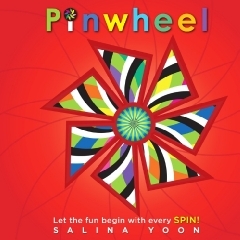 I had to check out Pinwheel , by Salina Loon because my kids so very much enjoyed Yoon's Kaleidoscope (linked to our thoughts) which was released last year. When I saw that Yoon had a new title, well, I was excited. Pinwheel is of equal delight to the eyes, being bright and colorful. Each page has a wheel that you can spin to watch a choo choo train race towards you, a school of colorful fish swim near an octopus and to see a carousel go around and around. If you know my children at all, you will realize that the last three things I mentioned makes this a winner with each of my children individually: the train lover, the ocean animal lover and the "horsey ride" lover. I flipped spun my way through this book during the children's nap time and I knew that my little girl especially was going to light up when she saw the carousel horse rise up over the top of the book. (The page opposite of the carousel is a kite flying up in the sky.) Sure enough, once she saw that horse, she had to work hard on her sharing skills. Each page spread is exciting in its own right. By spinning the wheel you can make fire glow in the heart of a hot air balloon or delight in a cloud of fireworks.Pinwheel is such an artistic book. Even I loved my time alone browsing through the pages. Each page design captures your imagination and you go on spinning, spinning, spinning . . . Truly this is a unique book. It gets bonus points for being a very sturdy book, with the exception of the beloved "horsey ride" page. Little hands want very much to love on that horse and when they see it coming over the top of the page they make a grab at it. It's not sturdy enough to withstand a firm grab so you'll want to be careful and provide some oversight as they look through the book. Also, it can be sort of tricky for younger kids to turn the wheel. My six year old managed the book best, although it is earmarked for ages 3-6. Salina Yoon has created a wonderfully designed children's book. If you get a moment, you might be interested to check out her blog entitled Penguin and Pinecone. Quite cute! My boys love it. Many, many thanks to LB Kids who sent a copy of this book in exchange for our honest thoughts. Once again, we honestly love Yoon's work! Further thanks because they offered one copy to one of my readers here! Would you like to win a copy? Simply leave a comment below! This contest is open to US Residents only and will be open through Tuesday, April 23rd. Best to you! Looks like a unique and fun book. Sign me up! What fun!!! It has been a while since we read a new Yoon title. What gorgeous colors! We would love to own this book! Thank you for the review! I know some little ones who would love it, too! I think my daughter would love this! My nephew would love this book!